Zterm does not need drivers but your serial adapter might. But if it is already working with whatever you are using now that means the drivers are already installed. So just launch Zterm and select the right port and go. Bruce my gauge is set up exactly like yours, today I got a nicer volt meter and it reads 8.82 volts, while serial communication says I am at 705.5 Torr, which equals ~8.85 volts so I have a problem there, either my voltmeter is off by 0.03V, or maybe it could be my power supply but I don't think so since it supplies 12v and has a capacity of 3watts. I would not fuss over 0.03 volts. It is truly a non-issue here. I would not immediately blame the voltmeter for such an error. I have 3 "Weston standard cells" for those in the know, these are the ultimate voltage source to about .001 volt and last for many years...50++years. They must never-ever see a load of any significance and about 1 microamp is their design limit of current draw, thus, a 1 megohm load is approaching the limit. The normal voltage of a weston standard cell is 1.019 volt +/- a few ten thousandths of a volt based on ambient temperature. All of my three cells on any given single meter read within a thousanths of a volt on the 2 volt range. I wondered how accurate are the free give-away chi-com digital meters found at Harbor Freight. If you don't have a free coupon and are forced to pay the list price of $5.99, did you get your money's worth?? The average was 1.018 about the ideal 1.019 or 0.001 volt! However the extreme errors on the worst meters were .004 volts high to .004 volts low. Thus, all of the junk Harbor Freight Chi-com meters are incapable of a .01 volt total gross error. By the way, my $200.00 Beckman read 1.016 and my $150 Fluke read 1.020. Now, we see, only 2 of the chi-coms were as bad as the Beckman and 2 of the chi-coms were as good as the fluke. I will never pay more than $10.00 for another digital meter. Thus, it is doubtful that any current digital meter can be off by more than 0.01 volt. more likely it is off by no more than 0.005 volts. If I go by what the meter says, then the analog output says the sensor's pressure is 600Torr, why could it be off? Is it fine that it misses by 100Torr at atmosphere? I checked every setting of the sensor and it seems to be in the factory default version. How exactly are you measuring the analog voltage? Maybe upload a picture of your current setup. The manual specifically states the analog measurement must be floating (see page 7 of the manual). What you are concerned about makes no difference to the low pressure readings that will matter for using it with a fusor. Have you spent any time reading the 901P manual? Page 4 describes "Sensor technology". There are two sensor elements in the device. A Piezo sensor measures (by mechanical deflection) the pressure relative to atmospheric. This is the one that will measure at atmospheric pressure. Initially it assumes at power on that zero deflection (ambient vs ambient) is 760 Torr. In operation it recalibrates this when the pressure gets below about 1.2 T and the other sensor rings in. Yours probably has a stored calibration from its previous use. The other sensor is a MicroPirani and measures by heat conduction in the gas. This measures all the way down close to 10E-5 Torr. Below about 10 Torr this is the only sensor that is used but it is not used at atmospheric pressure. Here is a chart from the manual that shows the ranges where the two sensors operate and the analog output. So even if your unit is very inaccurate at atmospheric pressure (it isn't) this has noting to do with how it will work at millitorr levels. On the analog voltage vs. the digital output via serial -- what command did you send it to ask for the reading? Seems only the PR3 version may give you the value that should be coming out. Here's the start of the manual section about this (p 15). The 901P transducer can provide pressure measurement output as an analog voltage or RS232/RS485 digital value. The digital value is 3 digits scientific notation for PR1, PR2 and PR3 reading and 4 digits for PR4 reading. The analog output is per default based on the combined PR3 reading and provides a 16 bit voltage output of 1 VDC/decade standard configuration. Refer to Analog output page 23 for details. As Richard said 0.03 volts shouldn't matter, but use the PR3 or PR4 command unless there is a good reason to want the specific sensor output. If you were not using the PR3 or PR4 command, try that and see if it changes anything. If you still plan to use an Arduino to read this thing, I would get one of those cheap serial interface boards and just talk to the 901P via serial. Although a nice analog meter (with a moving needle) might be nice when turning knobs to run a fusor. I am sorry if it seems I want my problems solved by you guys, I only want help and you've been very helpful and kind so far. I have read the manual several times now, it is a bit difficult for me because 1) English isn't my first language and 2) I am new to electronics so I have to google a lot of stuff I don't understand and sometimes I can get stuck for half an hour trying to understand some things. 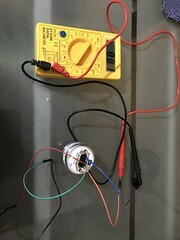 The negative side of the analog output is not connected to the negative side of the power supply input or to any other ground, it is just connected to the negative pin of the multimeter. @253AO2? ;FF@253ACK215;FF That means the analog output is set to send me the PR3 MKS Standard (1 VDC/decade) output. After all of this I got a 761 Torr reading in the serial command (probably from restoring the Pirani Atmospheric commands) and the voltmeter now reads 8.84volts, which doesn't match up that of the serial command. The owner did calibrate the sensor in his way, and even though I have it now back to default, I wrote everything down, in case I need to go back. Thanks, that was what I was thinking, then it means my unit is perfect for fusor work. And I do plan to use the Arduino but not with the ADC but instead with the serial interface, I just need a TTL adapter (cheap, but it would take +3 weeks to get it here, so I am searching local, I live in Mexico). That image looks about right for 150 mTorr. Good that you are getting comfortable with the sensor. I did think maybe the language could have been some difficulty for you with the manual. No problem, I understand. Everyting I have said is just from reading the manual. I haven't tried mine yet. I may not be exactly right. I'm not sure I would have reset those calibration values, but it probably doesn't make any important difference for fusor measurements. As I tried to say in my last post, I think a new piezo calibration value will get automatically stored when the pressure gets down to 1.2 T -- at that point it can then learn from the pirani sensor. So now that you have been down around 150 mT you may find that there is a new calibration for piezo that was stored. To calibrate the pirani you must get down into the E-6 Torr range and set the zero point. To do that, you would need a good diffusion or turbo pump to reach that pressure or below. That's why I would not have reset the pirani calibration. But even if the pirani zero needed some calibration, I would expect that for any readings from the sensor in the E-3 Torr range you won't notice any difference. Readings from the pirani depend on the heat conduction of the gas, which depends on the kind of gas. At the same actual pressure, nitrogen and hydrogen will indicate different pressures from the sensor. That's why you can set some different gasses in the sensor. But for fusor work exact pressures probably don't matter too much as long as you are not way off. More important is that the number you see is consistant and repeatable. Best wishes, keep going. 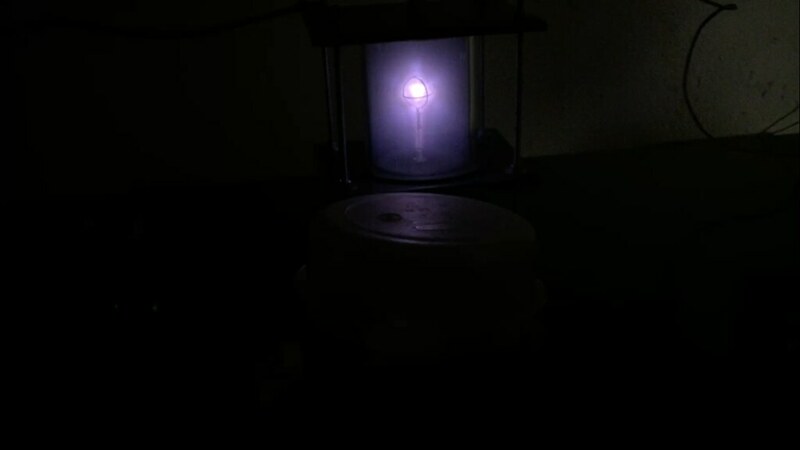 You are doing more than I am now on actual fusor work. By the way, your english in your posts is excellent. I only know a few words in Spanish. I am now in the process of reconditioning a used vacuum pump, it is a robin air 15600, though I would upgrade it for a Welch or a Precision Scientific for the moment is more than usable. I want to use this transducer to check the ultimate pressure that it can pull down, but I don't want to risk the electronics to oil contamination. Since the pump has an inlet with 2 flares I want to use the one with the 1/2" flare (and cap the other one) and figure out how to attach it to the 1/4npt to KF16 adapter I have for the transducer. My plan is that between the adapter and transducer I could place a needle valve, this way I can close it once I am finished measuring ultimate vacuum and then vent it through the other 1/4" flare. Do you think that it is safe to do it this way?